Red, SUNY Cortland’s first police dog, has officially joined the department, according to University Police Department Chief Mark DePaull. 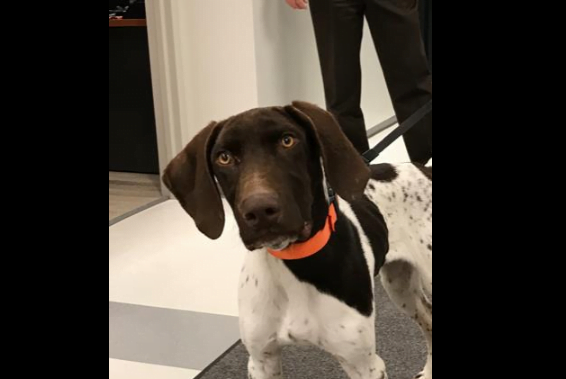 Red is a six-month-old German short-haired pointer, who will undergo about five months of training before walking the beat, DePaull said. As a skilled bomb-detecting and tracking officer, Red will also act as a police ambassador on campus. “He’s not going to be an average police dog,” DePaull said. Understanding that some people are afraid of dogs and police officers, the department opted to go with a less intimidating breed than a German shepherd in the hopes that the K-9 could help increase campus community. “It’s so much easier to break down some of the barriers when you’re walking with a dog,” DePaull said. Red won’t be trained to bite or protect his handler, but he will be trained to interact with students, which will likely include lots of petting. DePaull hopes Red can take part in future PAWS for Stress Relief events - days set aside during finals weeks when dogs are brought on campus for students to love on. But Red is joining the College for more than just snuggles. His presence will protect students, faculty, staff and community members from bomb threats during large campus events, such as graduations, football games and concerts. After the 9/11 terrorist attacks, colleges were designated soft targets, or vulnerable to attacks, DePaull noted. Pressure cooker bombs in bags were used in the 2013 Boston Marathon bombing that killed three and injured more than 260, he added. Currently, UPD requests services from other bomb-sniffing dogs, such as state police and SUNY Cobleskill K-9s, to sweep campus buildings before big events, Asst. Chief Eric Rabusin said. Red will also screen suspicious packages sent to the college. Suspicious packages sent through the mail became national news in October after a 56-year-old Florida man, Cesar Sayoc, sent 16 packages containing explosive devices to Democratic leaders and detractors of President Donald Trump, according to federal authorities. Tracking down missing persons will also fall to Red, DePaull said. Red could help campus officers find a lost student, as well as lost children or vulnerable adults in the community as part of a mutual order of understanding with the Cortland City Police Department and the Cortland County Sheriff’s Department. SUNY Cortland seniors Harley Buczkowski and Marissa McGraw said Tuesday that Red would be a positive addition to the campus. But the women thought a drug-sniffing dog might be more useful for campus police than a dog trained for bombs and tracking. “I just think there’s a lot of issues with drugs…” said Buczkowski, adding that she experiences asthma attacks when other students in her dorm smoke marijuana inside. The smoking has continued even after informing her resident assistant, she said. But considering that most large-scale community events occur on campus and require a bomb sweep of the event space beforehand, an explosive-detecting dog will a consistently used asset for the college, said city police Lt. David Guerrera. “It will definitely be valuable for them,” Guerrera said. The city police department has two police dogs trained in drug detection and human tracking, K-9 officers Lummel, a Belgian Malinois, and Rush, a German shepherd. 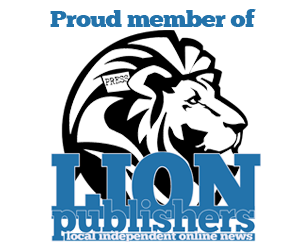 “I’m amazed by them, by what they can do,” Guerrera said. While the dogs are expensive - they require a police vehicle be outfitted with a special compartment, additional compensation for the officer who takes care of the dog on his or her off hours, veterinarian bills - the dog’s skills are worth the cost, he said. The total cost of Red, re-outfitting a police vehicle and Red’s training will come to about $12,000, DePaull said. But the department received a $3,800 grant from the Sean M. Walsh K-9 Memorial Foundation, a non-profit with ties to Homer, to help offset the cost DePaull noted. And they’re great for connecting with the community, Guerrera said. “Kids and people love dogs,” he added.